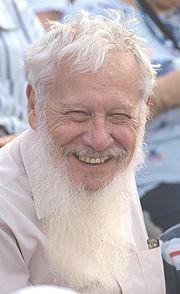 Robert John Aumann (Hebrew name: ישראל אומן – Yisrael Aumann, born June 8, 1930) is an Israeli-American mathematician and a member of the United States National Academy of Sciences. He is a professor at the Center for the Study of Rationality in the Hebrew University of Jerusalem in Israel. He also holds a visiting position at Stony Brook University and is one of the founding members of the Center for Game Theory in Economics at Stony Brook. Aumann received the Nobel Memorial Prize in Economics in 2005 for his work on conflict and cooperation through game-theory analysis. He shared the prize with Thomas Schelling. What happened to Rosenberg? No mention of him here.